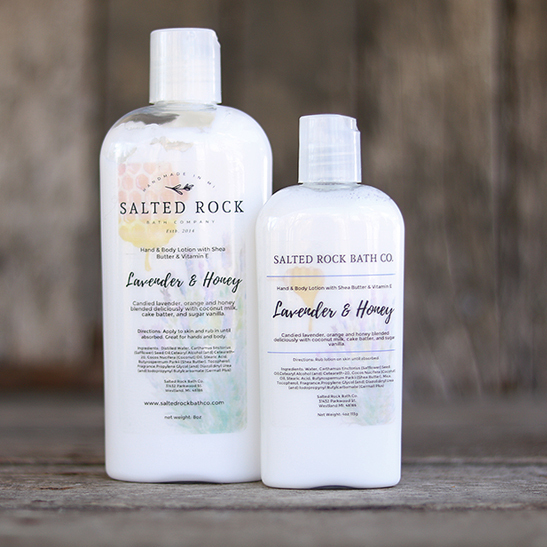 lavender and honey body lotion – Salted Rock Bath Co.
Our shea and vitamin E lotions moisturize and hydrate your skin with all natural ingredients which leave you with long lasting, silky smooth skin. Fluffy Candy body lotion is chock full of vitamins and minerals including vitamin E and C which are thought to protect skin and help keep its youthful appearance longer. The scent: Candied lavender, orange and honey blended deliciously with coconut milk, cake batter, and sugar vanilla. Safflower Oil: Thought to be high in oleic acid which is considered to help moisturize, nourish and restructure the skin.